Every single person living in contemporary Western civilization have the sardonic privilege of belonging to one of the most sheltered populations in all of human history, to the point where most of us haven’t even witnessed the killing of an animal for the purpose of something as quotidian as nourishment, though most of participate in this process of industrialized violence on a daily basis as consumers. We take it for granted that violence on the human interpersonal level is stigmatized and frowned upon as an inexcusable and unintelligent reaction, which conspires against our social nobility. This wasn’t the case in the past. When we are confronted with the high tolerance of violence and inequality in past societies, we react with disbelief. Surely, such a culture would spiral into total chaos. Temporarily it might have, from time to time. But in the bigger picture it did not. Even legally, violence was often casual. A matter of expectation. Most of us experience violence only in spontaneous or relatively rare incidents, and for the most part we are happy it doesn’t happen more often, though we care less when violence is institutionalized, outsourced, or exported. Finally, it is in the latter example that our ancestors might find some common ground with us, as violence towards outgroups provided opportunities that even ultramilitarized tribal societies were unable to amongst between themselves. If one conflates the concept of “nobility” with nonviolence, past peoples were certainly not the noble savages we like to imagine they were. Not my ancestors, yours, nor the ancestors of other folks. Historical populations and ethnic groups subjected to atrocities by industrialized nations in recent memory, are themselves nerfed down for the sake of convenience, forgetting that they — like many, probably most historical, vigilant, self-advocating populations, had a relationship to violence few decent people today would be willing to accept. But that measure of decency is relative. It seems that people are hard-wired for in-group preference, and suspicion, even prejudice towards outsiders. It is the norm rather than the exception for pre-state societies, historical or contemporary, to subject their neighbors and competitors to behaviors that either border on or cross into the realm of the recent concept of crimes against humanity. As I peer out the window from my desk, down on New York’s gum and dog piss stained streets, I am amazed that we are able to get along at all. But if it weren’t for that one ideology all Americans are taught since childhood, I don’t think it would last even another week. Certainly not in this city, where human tragedies such as traffic accidents by necessity — certainly for the sake of effieciency — are converted into mild personal annoyances by the metabolism of the big city. The first time you see someone laying face down in the New York gutter, you stop to care for them. The sixth time, you groan. We established that people struggle greatly to see the other as themselves even when they are similar. But what happens when these perennial self-grapplings of human nature are brought to deal with ever increasing groups of non-human bodies and intelligences? It turns out that people have a high tolerance for (or possibly even an impulse towards) violence against machines, yes, and robots particularly, who, with their real or imagined similarity to humans, autonomy etc. appear to trigger uncomfortable features in human psychology that allowed us to survive and thrive as tribes in the past. Coldly justified historically, these attributes are objects of awkward self-scrutiny today. I am no technologist. In terms of my grasp of artificial intelligence I am nothing but a man among men. But I wonder I wonder if autonomous artificial lifeforms would ever be accepted into human society (or if they ought to), and if this will become a political hot topic as artificial intelligence exponentially develops. I don’t know what their physical likeness will be when they break the waves. Be they individual or legion. If they will develop a common ethnogenesis, a mythology, or identities of their own. Would they demand rights, self-segregate, form states, and break off into tribal conglomerates? Would they fight amongst each other, or would their demands for equality defame the sanctity of human life, and make life itself a cheap commodity? I imagine to expect the riots of luddite warbands. 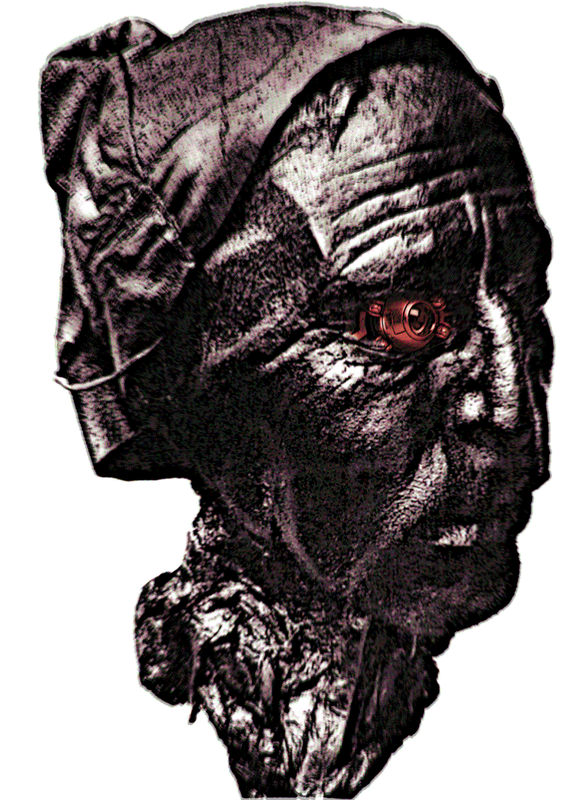 I wonder if the bog bodies of the future will be cybernetic, and which artocities, if any, archaeologists will uncover from the future tribal wars and possibly endemic warfare between organic and synthetic organisms, and what traces of human ancestry entities of the distant future will find. And I wonder if they will ever ask questions what we thought and what we believed. In the last ice age, the landmass of what is today Scandinavia was pressed into the earth’s crust under sheets of deep and unfathomably heavy ice. As soon as that ice began to recede, the land was rejected by the depths. It’s been ten thousand years since that ice age ended, but the Nordic is still rising at a rate of a few millimeters every year. This so-called post-glacial rebound has immense and long-term consequences for archaeology, and how time is perceived in relation to the landscape. When I still worked at a museum, I used to illustrate this phenomenon to foreign tourists with a stock joke, about finding poetic justice in that the underdog nation of Norway slowly rises out of the depths, while the Danes, our old time oppressors — hyperbolically speaking — are being slowly flushed away by our North Sea, our venerable mother. Schadenfreude is a beautiful part of inter-Scandinavian jargon. But this is changing. Denmark may well have one last chuckle before they go the way of Doggerland. You see, the rate at which the sea levels are rising is gradually accelerating. In Norway, it is expected to out-compete post-glacial rebound rather soon. While it is true that, compared to Denmark and, yikes, the aptly named Low Countries, most of Norway sits defiantly perched at a safe height above the sea, we’ve still spent the better part of the past thousand years making ourselves comfortable, and hence vulnerable, along the coastline. We emerged from a seafaring culture, so it follows that our most significant urban centers are neatly placed along the sea. In Norway, the UNESCO heritage site of Bryggen in Bergen is widely considered the quintessential example of a future climate casualty, a Scandinavian venice, essentially. Ironically, the sea levels threatening to swallow the site will sooner or later match the sea level when king Oláfr Kyrri first established it as the future trading hub of the kingdom, soon an empire, then a province, then a nation. Past and present landscapes converge. So far, archaeologists working with the origins of maritime livelihoods and early coastal settlement have had to look for it up in the slopes and hillsides, as much as 40 meters above the current sea level. In one apparent worst-case scenario, the sea level will rise by five meters by the year 2200. People will find themselves in the peculiar situation of returning to the coastline of the early Viking Era. 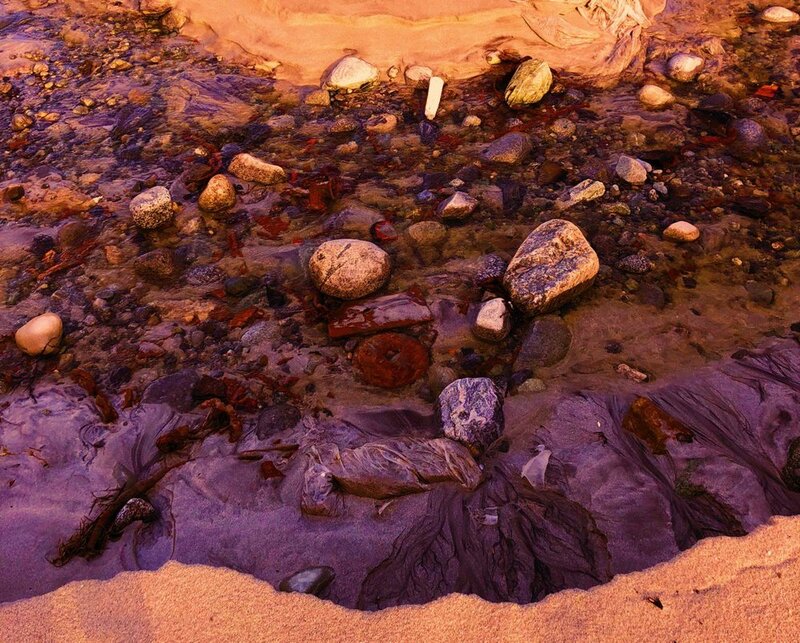 Conversely, the relics left after us — their own close ancestors — will in many cases be underwater. It will be an interesting time for marine archaeologists, and once again people will swim on the beaches of the Iron Age. By Ain! From the future, Omid’s friend received the image file tidarbrot.tif! 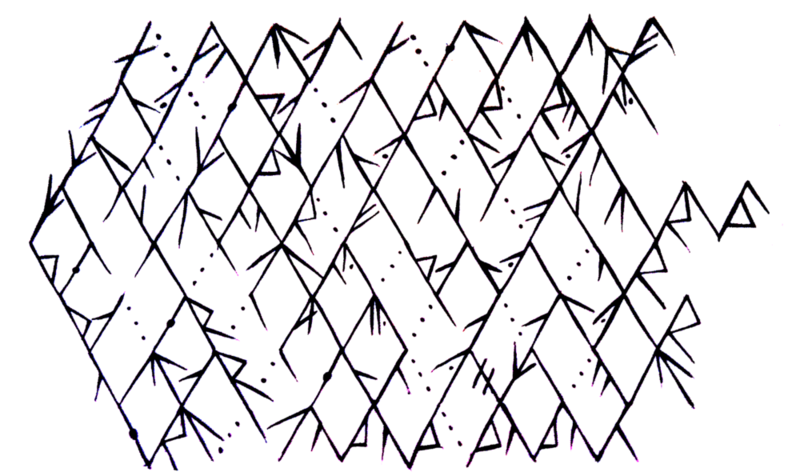 “What in the blazes could this be?”, she wondered, “Tíðarbrot ought to mean something to the effect of fragment of time?” It turned out to be a digital scan of a runic inscription, executed in the runic script of the Middle Ages, with alternating east- and westward drooping and interwoven staves. •Translate with kennings marked and deciphered. Miðmundi miskunnar ok stríðs fisks landa mun ǽ kallask ǫnd ellilyfs eða rǫnd tíðar. Þessi stund þandi ár þá er skáld sá aldir allar senn. Dǿmi ǫll eru þaðan svaðað. The point of equal distance between [[the land fish's] mercy and struggle] may be called the [breath of the old-age-remedy] or [time's rim]. This moment outstretched years when the poet saw all ages at once. All examples from thence have slid. Omid's friend began to interpret: The first helming (i.e. Half stanza) may be characterized as a description of a sort of non-perspective of time in mythological terms. The helming's word-order is shuffled in accordance with the typical heavy drottkvætt style, as well as one (or two, depending on how we count it) multi-layered kenning. If, for the sake of simplicity, we ignore the kennings, it says that “The point of equal distance between summer and winter may be called the breath of the old-age-remedy or time's rim”. What is the middle point between summer and winter? Is the poet trying, with this peculiar expression, to point towards a time outside of time? That this point can be called rǫnd tíðar – “time’s rim” seems like a reasonable claim, provided we accept the foundation of such a “moment” in the first place, but what does it mean that we can also call it ǫnd ellilyfs – “the breath of the old-age-remedy”? I'll have to leave that unanswered for the time being. The second helming has a prose-like syntax and no kennings. Apart from a rather artificial application of the verb tenja, the contents are fairly straight-forward considering the circumstances. The first sentence, Þessi stund þandi ár þá er skáld sá aldir allar senn, “This moment outstretched years when the poet saw all ages at once”, begs the question “which moment?” Here, it is reasonable to imagine ourselves looking at the non-time that the poet provided a general description of in the first helming, from a more personal point of view, perhaps from a certain moment in the poet's life where he observed it. The last sentence, Dǿmi ǫll eru svaðað þaðan, “All examples from thence have slid.” Sliding, slithering like the old serpents perhaps? Once again the poet adopts a general perspective. It is tempting to read this through the eyes of Plato: All realizations of phenomena (dǿmi “examples”) pour into time from a place outside of it (þaðan “thence, from that place” in the context of the stanza), but this is probably a forced interpretation. As long as the future remains uncertain, so will tíðarbrot's underlying concepts continue to baffle us. Contents licensed under Creative Commons. A rune, red is she. Red, in white skin carved. to the dawn of days. letters carved as odes and psalms.